With zucchini in season and a garden full of herbs, I had plenty to work with for creating a quick and easy meal. For this dish, I sauteed shallots and garlic, tossed in some baby portabella mushrooms and julienne zucchini, added some lemon basil chiffonade, then finished it off with a dry white wine and some grated Parmesan. Using julienne and thinly sliced vegetables makes the dish cook up faster and adds some visual interest as well. You can find julienne peelers or mandolines at many stores or online, or you can use a very sharp knife and cut thin slices and then stack the slices and thin slice again lengthwise for julienne. To chiffonade the basil, lay the leaves on top of each other, then roll them into a cigar shape. Using a sharp knife, slice across the cigar starting at one end and working your way to the other, making very thin cuts. 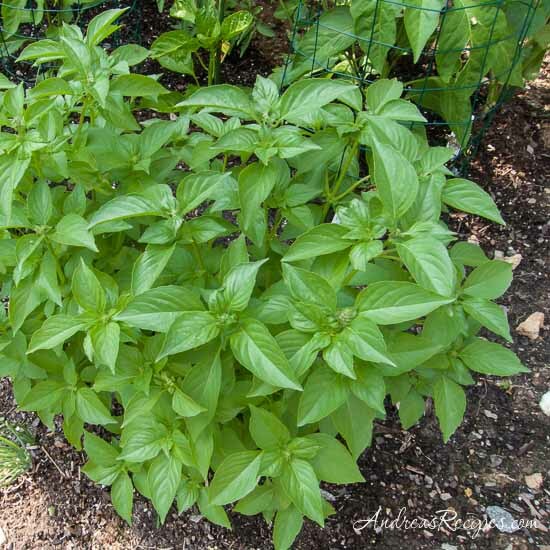 You can user either lemon or Genovese basil, though we liked the fresh light flavor from the lemon basil. 1. Heat the olive oil in a large skillet over medium heat. 2. Add the shallots and garlic, and saute until wilted and limp. 3. Add the mushrooms and saute for 2 minutes, then add the zucchini. Cook until the zucchini softens, about 4 minutes. 4. Add the basil chiffonade and white wine, and cook until the wine reduces by about one half. Add the grated Parmesan and cook for 2 more minutes. Toss with the cooked farfalle. This looks really good! I love zucchini. I can’t understand why some people run from it. Or mushrooms. I love them both. That looks extra good Andrea and so in season. What a wonderfully light, summery pasta this is, Andrea. I tried lemon-basil a few years ago and have been hooked ever since. Thanks for the delicious recipe. Andrea great recipe, thanks for sharing. 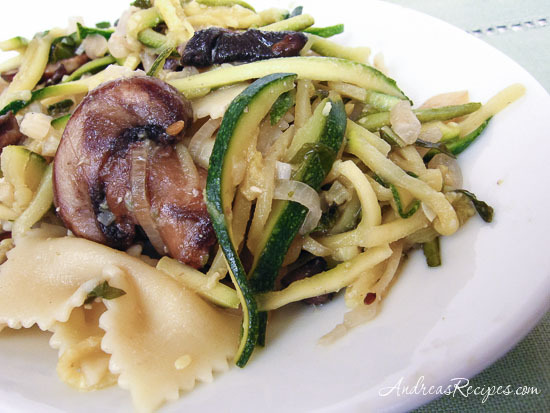 I love zucchini and portabella mushroom. I made something like this last week but with out the pasta. It was my no pasta and bread week. What beside garlic can you use. Wild Garlic Ramson or Bear Garlic .I use a lot of fresh herbs.Mainly ginger,rosemary and basil.But because of the effect of garlic though I love the taste I seldom use it. My husband and I limit it from our diets. This looks amazing! We have crazy amounts of lemon basil right now, and I’ve been trying to find new recipes to make use of it. Thank you for this! Could this possibly be done without white wine? Some other substitute perhaps? I would like to cook this dish this upcoming Friday but won’t have access to white wine. Hi Tamar. You can use water instead of the white wine.